Today marks the first day of eating disorder awareness week 2017. This is such an important week for me as most people know and I will be sharing lots of information about eating disorders to try and raise as much awareness as possible. Awareness is key to diagnosis and recovery. Because of a lack of awareness, my eating disorder went undetected for 14+ months until my life was at risk. People deserve to get the care and treatment they need in terms of their eating disorders from the moment they develop one. Some people, particularly those who are young, may be diagnosed with an eating disorder not otherwise specified (EDNOS). This means you have some, but not all, of the typical signs of eating disorders like anorexia or bulimia. I was diagnosed with Anorexia in 2014. Anorexia Nervosa is currently the most lethal psychiatric disorder, carrying a sixfold increased risk of death. Although Anorexia is by far the deadliest eating disorder, death rates are also higher than normal in people with bulimia and “eating disorder not otherwise specified” (EDNOS, a common diagnosis for people with a mixture of atypical anorexia and atypical bulimia). Suicide is also a particular risk as 1 in 5 Anorexia death are due to suicide. People diagnosed with Anorexia between the ages of 20 to 29 had a higher death rate (18-fold) with the age group 15-19 following close behind with a ten fold. Spotting the signs of an eating disorder can be difficult. Remember – a person with an eating disorder does NOT have to appear thin or underweight. So, whose affected by eating disorders? A 2015 report commissioned by Beat estimates more than 725,000 people in the UK are affected by an eating disorder. Eating disorders tend to be more common in certain age groups, but they can affect people of any age. Binge eating affects males and females equally and usually appears later in life, between the ages of 30 and 40. As it’s difficult to precisely define binge eating, it’s not clear how widespread it is, but it’s estimated to affect around 5% of the adult population. Suicide is a topic that is usually not talked about. People are afraid of the word suicide. No one wants to imagine someone they love thinking about or dying by suicide. This is why no one talks about it. But the thing is, we need to talk about it, because its not as uncommon as people think. One in Four (26%) young people in the UK experience suicidal thoughts. One person dies every 40 seconds by suicide worldwide – that is an estimate of 1440 deaths by suicide a day! By 2020, the rate of death will increase to every 20 seconds. 2880 people will be dying of suicide a day… How can there be such a negative stigma surrounding suicide when it claims so many lives in simply a day? Suicide has now become one of the three leading causes of death among those aged between 15-44. More than 4,000 children under the age of 14 tried to take their own lives in the UK in the year 2007. The point is: if you’re not experiencing suicidal thoughts, someone you know is. Many people have suicidal thoughts at some point in their life. Feeling this way means that you have more pain than you can manage at the moment, and that’s totally okay. Remember that someone who has thoughts of suicides may not necessary attempt suicide. Suicide thoughts are different to suicide attempts but this does not mean their feelings are invalid or should be overlooked. If you notice any of these warning signs in a friend, relative or loved one, encourage them to talk about how they are feeling. Also share your concerns with your doctor or a member of their care team, if they are being treated for a mental health condition. After a few close together meltdowns these past few weeks, I’ve realised that perhaps the majority of people around me do not know how to handle this situation. If you’ve read this and still feel confused, I’ll explain a meltdown. It’s basically getting overloaded with too much information and the only way I can cope with this or to regulate my emotions is to completely shut down and stim (repetitive behaviours such as rocking, verbal sounds, hand flapping etc). In these meltdowns I pretty much turn into a toddler – mostly non-verbal, no eye contact, no compliance with direction and self-destructive behaviours. So now you know what my meltdowns are, you’re probably still a little uncertain on what you have to do. This is why I’ve created a sensory bag that contains everything that will keep me calm and help shorten the meltdown. See below for some useful tips. Do not stop any stimming behaviours – they help me regulate my emotions. Only intervene when I could possibly cause danger to myself. If I am rocking too close to a wall, move me instead of stopping me rock, for example. Understand that there may not be a reason for my meltdown. If I cannot give an explanation, be at peace with that. Sit close to me or even hold me unless I resist this (depends on my mood). Deep pressure against the skin combined with individual input often calms the nervous system in places such as the legs or the hands. Constantly reassuring and pressure to these parts of the body allows me to know you’re there whilst keeping me with reality. Whenever possible – go for my sensory bag! If its not on me, it will be in my room. These items will calm me. There will be communication cards in here that will help me communicate with you when I become non-verbal. Talk everything Gruffalo. I am utterly obsessed and in a meltdown the Gruffalo becomes an anchor. Find the story on youtube and play it for me – Find it here. My sensory bag contains the books – let me read them. If you don’t have the books, encourage me to say them (I know them off by heart). Let me walk, run or spin. Follow me as I tend to wander. This lets me release my energy. I may have panic attacks during meltdowns. Watch out for fast breathing. Gruffalo books, thinking putty, ear defenders, sensory bottle, chewys, tangles, fidget toy, communication cards (unpictured), blanket (unpictured) and gruffalo teddy (unpictured). Today I’m struggling. I know its partly down to the fact that I’ve only been on an SSRI medication for over a week. I know that the drug causes increased anxiety and a higher risk of suicide during the first few weeks as your body adjusts. I’m just very tired. Medication isn’t a miracle drug and it definitely doesn’t cure mental illness but I really hoped by now I would be starting to feel even a little bit better and not worse. All I’ve done today is sleep and walk with my headphones blasting because I feel so low that I can’t even function. I haven’t had suicidal thoughts in such a long time and even though I know I won’t act on them, its sad to think that if you told somebody they’d deem you crazy and unsafe and probably think you were going to take your life. Suicidal thoughts don’t necessary mean the person is going to go out and kill themselves…it just means they’re finding it hard to exist. We shouldn’t have silence towards suicide. We should turn towards the word, listen, offer support. Appreciate every single person. Look for subtle signs of problems. Warning signs of low mood and suicidal thoughts are there, they just need to be picked up! 2. Don’t assume the person can tell you what he or she needs. Don’t assume the person knows what they need. In times of stress, it’s common not to know. If they’re sharing with you, most likely they just need you to listen. Offer/do practical things for the person. If they’re stressed, help take off their workload and do some things. Sit with them if they’re spending too much time alone. Remind the person to engage in self-care. Offer to go to the movies, meet for coffee or go on a walk with them. Friends and family of those with mental illness need to manage their own stress as well. Check in with the person. One reason that mental illness is so isolating is because people don’t talk about it. While it can be uncomfortable for both the person struggling and you, it’s uncomfortable for them not to talk about it, too. They’ll appreciate knowing that you care enough to check in. 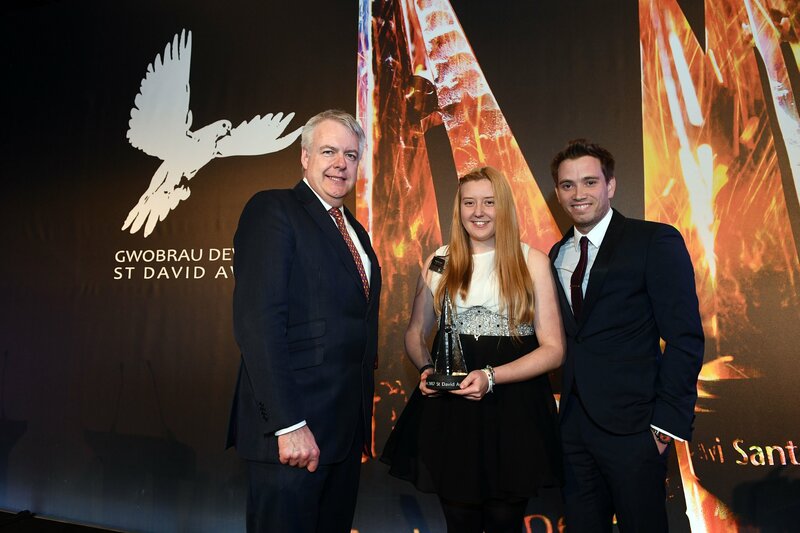 Today I woke up at 6am to travel all the way to Wales for the St David Awards. I was so anxious that I actually felt physically sick but it was such a good event and everyone was so friendly. We arrived and had some breakfast before I had some professional photos taken and spoke to some journalists. We chilled for a little while before the First Minister came and announced all the finalists to the stage. I am in the young person category for my mental health campaigning and special needs volunteering. It was really lovely to see everyone there today and hear about all their achievements. It’s really overwhelming to think that people feel you deserve a national welsh award for ‘exceptional people in Wales’. I feel so incredibly blessed and feel so motivated to continue reaching out to others in similar situations to my own. The whole reason I started this personal journey to recovery was because of the amazing people who kept pushing and pushing for my life. Without my family and my close friends, Anorexia would’ve claimed my life 2 years ago. With them, I began to fight for a new life and with it found the amazing joy of helping others. So many people reached out to me during my darkest days and I realised I was never alone no matter how isolated I felt. I still get emails, facebook messages, and letters from those who wish to thank me for my work. For 2 years, I’ve exposed my inner and most darkest secrets, all my thoughts, and all my struggles in the hopes that it can help others in the same situation get the help they need. Exposing yourself to the world is one of the hardest things you can do – because it feels like everyone can criticise your thoughts, feelings and behaviours. However, I don’t regret ever starting this blog and sharing my story because if one person is helped then thats enough to change the world! Mental Health problems are such a taboo subject and people struggling are more often than not stigmatised. Every single day I will fight to change this view. Mental Health problems are not a liability. They are not shameful. They are not cowardly. They are not only experienced by the weak. Mental illness has no victim. It affects people of all ages, all backgrounds, all cultures and all social class.